The well-organized protests were carried out on Martin Luther King’s birthday by activists calling attention to the deaths of unarmed black men at the hands of police in Missouri and New York. “There cannot be any tolerance for this,” said Colonel Timothy Alben, superintendent of the Massachusetts State Police. At a morning news conference, Alben blamed protesters for “endangering people’s lives” and delaying ambulances rushing to hospitals. “There was no place to go,” said Scott Cluett, operations manager of EasCare Ambulance, who said the ambulance heading to MGH was delayed about 20 minutes. 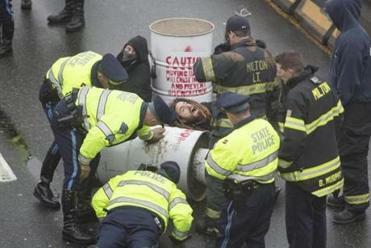 Eleven protesters were arrested in Milton, and 18 in Medford. Two other people were arrested in Braintree trying to return a rental truck used in Milton. Most of the protesters were in their 20s, though a few were in their 40s. Among them were people who listed their occupations as a librarian at Harvard University, a makeup artist, and self-employed music producer, court records show. Protesters face charges that include trespassing, resisting arrest, disorderly conduct, and conspiracy, authorities said. They all pleaded not guilty, and were released without bail. “The disregard for the safety and welfare of innocent citizens that this action manifests is shocking,” said Michael Morrissey, district attorney in Norfolk County. 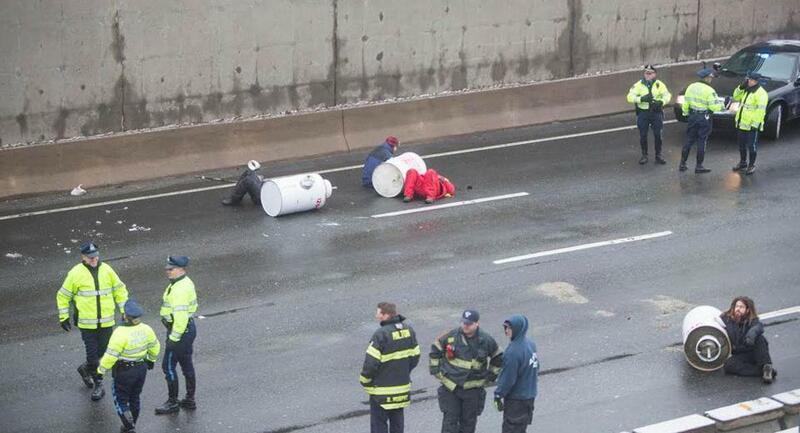 The demonstration began at 7:30 a.m., when protesters stopped the box truck on I-93 north in Milton and unloaded four 55-gallon barrels filled with concrete, authorities said. In the face of oncoming traffic, they spread them across each lane of the highway and six people chained themselves to the barrels. At roughly the same time, the second protest blocked the southbound highway in Medford near the Mystic Valley Parkway, as more than a dozen demonstrators tied themselves together using PVC pipe. In Medford, troopers quickly removed the protesters from the road. But in Milton, where protesters had placed their arms through the heavy barrels, emergency responders had to cut away the concrete to extricate them. One of the protesters told a trooper, “I’m here for 4½ hours, there’s nothing you can do,” according to police. Another, asked whether she could release her arm on her own, refused to answer. State Police said some of the protesters had worn diapers, apparently expecting the protest to last for hours. The highway did not fully reopen until 9:45 a.m. The protest in Medford completely blocked traffic for a time, prompting some drivers to get out of their cars and yell at the protesters. They later thanked troopers for clearing the road. When troopers approached the Medford demonstrators, they sat down and started chanting, “Black lives matter,” police said. In a statement, protesters described themselves as a diverse group of “non-black people” allied with the activist group Black Lives Matter, which has held several peaceful marches in Boston since a grand jury in Ferguson, Mo., decision not to indict a white police officer in the shooting of teenager Michael Brown. “Today, our nonviolent direct action is meant to expose the reality that Boston is a city where white commuters and students use the city and leave, while Black and Brown communities are targeted by police, exploited, and displaced,” said Katie Seitz, one of the protesters, said in the statement. Daunasia Yancey of Black Lives Matter attended the Quincy District Court arraignment of the Milton protesters. “We support the actions,” Yancey said. Sugrue said there was no advance warning of this demonstration from any sources, including social media and protest groups that police have been talking to. “It was unexpected for us,” he said. It took drivers four times longer than usual to travel north up a 5-mile section of the expressway between Braintree and Milton. According to state transportation statistics, the average time spent on that commute during the last three months between 5 a.m. and 11 a.m. was less than 15 minutes. On Thursday, it was an hour. Philip Wood of Rockland, who owns a construction company, said the delays caused him to send a dozen of his workers home without pay after a company truck was stuck in traffic. Wood said he was not unsympathetic with the protesters’ cause but said there are better ways to go about it. “All they do when they do something like this is alienate people to their cause,” he said. Governor Charlie Baker and Mayor Martin J. Walsh of Boston criticized the shutdown as dangerous and disruptive. At MGH, some patients called to cancel while others were late. Some employees and doctors were delayed and had to reschedule patients. Three patients headed to Brigham and Women’s Hospital for morning surgical procedures were up to two hours late because of traffic, said Lori Schroth, a spokeswoman. The hospital adjusted the schedule and all the patients had their procedures as planned. Peter Racicot, senior vice president for Fallon Ambulance, said the shutdown slowed responses across Greater Boston, affecting as many as 100 ambulances. “This incident has caused havoc for public safety,’’ he said. Liz Kowalczyk, Nicole Dungca, David Abel, and Evan Allen of the Globe staff, and Globe correspondents Jean Lang and Aneri Pattani, contributed to this report.